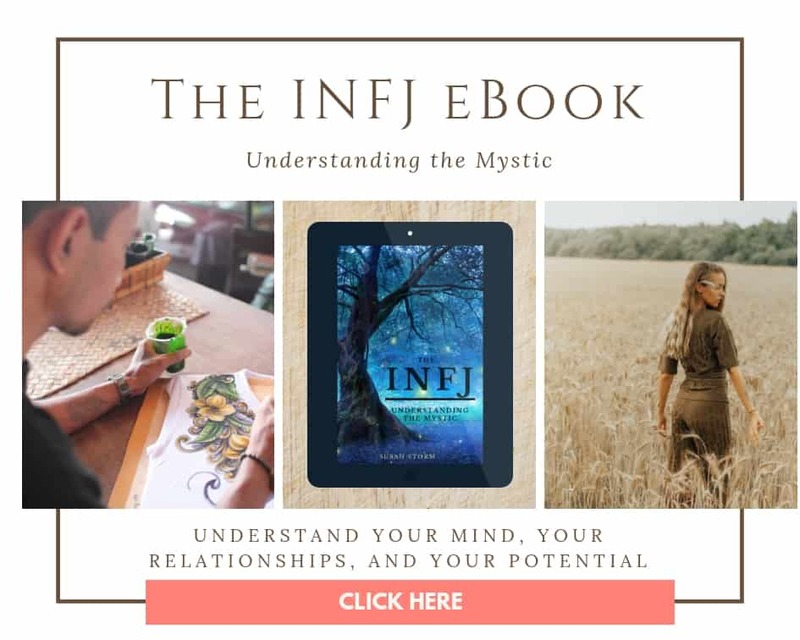 INFJs and INTJs are two unique personality types in the Myers-Briggs® system. There are 16 types altogether, and these two types are extremely rare – comprising only 3.6% of the U.S. population. These two types have many things in common, as well as some very big differences. Today we’re going to explore five of the shared strengths and weaknesses of these two fascinating types. Both of these types define themselves in the terms of their own viewpoint. The inner world is the REAL world to INJs. The inner world of ideas, impressions, facts, and reactions is what gives them energy more than the outer world of people, things, activities, and events. Both of these types tend to be reserved and private individuals – they can be passionately intense, but also self-aware. INFJs and INTJs are both more attuned to the big picture than the details and facts taken in by the senses. They look for underlying patterns beyond what can be tangibly proven. They have vivid imaginations and a fascination with what is unknown or still to come. They are less interested in material things and more interested in understanding theoretical concepts and new ideas. No, this doesn’t mean they are judgmental (although some can be). This means that in their outer world they like to have things organized. They like having closure and working before play. They prefer to do one thing at a time, rather than multi-task or shuffle between many different projects and activities at once. They like to finish one goal before proceeding to another. The dichotomies are just the first layer of type theory. They give us a surface-level understanding of how type works. To really understand personality type further we need to delve into the deeper layer of type dynamics: the cognitive functions. You see, each of us uses sensing, intuition, thinking and feeling. We all do. The question is, which do we prefer most? What order of importance do we give each preference? What attitude does each function have? For example, an INTJ uses a mental process called Introverted Intuition, or “Ni” for short. An ENTP uses a process called Extraverted Intuition, or “Ne” for short. Both types use sensing, INTJs have inferior Extraverted Sensing (“Se”), while ENTPs have inferior Introverted Sensing (“Si”). The position of their preferences (dominant, auxiliary, tertiary, inferior) as well as the direction of their preference (introverted or extraverted) makes a big difference in how they think and decide. You can find out more about each cognitive function here. This means that they search for grand patterns, themes, and clues that hint at the underlying meaning or significance of everything. They get flashes of insight that may appear to come out of nowhere – these insights may contain a fully-realized awareness of how things will play out in the future. Right now you might be thinking “Wow, this sounds a little woo-woo or ridiculous.” Believe me, it’s not psychic or fortune telling (they can’t tell you if you’ll find love or if you’ll die alone). INTJs and INFJs continuously process little bits of information to understand where things will lead. They view everything in the broadest, most complex sense. They believe everything has deeper meaning. They ask, “What else is going on here? What am I missing? What’s happening behind the scenes? What does this mean for the future?” Their main goal is to understand life itself – it’s origins and its purpose. 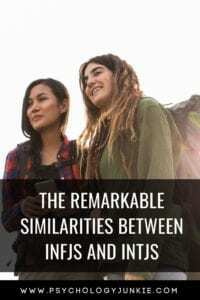 While some types (I’m looking at you ESTPs and ESFPs) LOVE a lot of commotion, activity, spontaneity, and sensory input, INFJs and INTJs tend to get worn down by it. The inferior function is one that we tend to feel uncomfortable using for large chunks of time. We feel incompetent when we have to rely on it and because we feel insecure about using it we can see it as unimportant or “shallow”. Extraverted Sensing is an information-gathering process that focuses on objective, tangible reality. It doesn’t read into things like Introverted Intuition does, it sees things for exactly what they are. ESTPs and ESFPs (who are the masters with this function) are often called “the ultimate realists” because they rely on this function so frequently. They can handle a lot of sensory input and can react to sudden changes and crisis’ in their environment with swiftness and clarity. They truly live in the “now”. INFJs and INTJs prefer to live in the “someday”. Everything is about the future. Everything they see they have to make more complex, they have to probe deeper, to understand where it fits in with the universe. A tree isn’t just a tree (as an SP would believe), to an INJ it’s a symbol of life, it’s a sign of bounty, shade, protection, paper, houses. It’s a reminder of the fact that maybe in the future there won’t BE any trees. It triggers thoughts of environmental collapse or improvement. An INTJ or INFJ can spend a great deal of time analyzing the origins and meaning and symbolism of the tree while an ESP has climbed the tree and pulled off some apples and eaten them. Because Extraverted Sensing is the INTJ or INFJ’s weaker function, they struggle in loud, chaotic, sensory-filled environments. They tend to get over-stimulated quickly and they like to do things one-at-a-time. They like to theorize, extrapolate, and analyze. Just jumping right into action can be jarring for them. Interruptions are like a slap in the face, and they may become uncharacteristically angry when they are interrupted. While ESPs thrive on variety, spontaneity, and a lot of commotion – INTJs and INFJs find this disruptive and unsettling. These two types like quiet, peaceful environments. They like knowing how much time they have to complete a project. They like focusing on it in-depth until it’s finished. They like being alone with their thoughts to consider patterns, meanings, and symbols. They enjoy occasional moments of adventure and sensory input – and it’s even good for them to have moments where they embrace their sensing side – but having to use this function for very long can result in “grip” stress reactions. INFJs and INTJs have a lot of strengths to bring to the world. They see that things are all interrelated and find connections that seem unknowable to many other types. When they develop their mental processes wisely, they can gain meaningful insights into what’s going on beneath the surface or where things will lead. They are outside-the-box thinkers and imaginative strategists. They see future possibilities and can work backwards to create a plan of action to achieve or circumvent those possibilities. Want to Learn More About INFJs and INTJs? Thank you again, Susan! I love your work. ?? Thank you for this wonderful blog . As and INFJ I appreciate the knowledge you chose to share with the world . May Peace and Prosperity be with you forever. Thank you again.